A few weeks ago was my birthday and 2 weeks ago I celebrated with a few of my friends. The reason it was so late is because it was very hard to find a date that all of us were free. This year we arranged something special, kind of a surprise birthday with a twist. The person who’s birthday it is does not know what will go on that day. S the other people have to arrange an activity. Normally the one who’s birthday it was arranged something but we wanted to try out something new. And I have to say that I like this arrangement! For my birthday we went to Arcen (Holland) and we went to some sort of spa. The water they use in the facilities is mineral water, so it is very good quality water. There were pools (inside and outside), they had a sauna, infra red cabins, hamam, solaria. There was everything you needed. But I have been to better ones. You did have a variety of things to do, but for a few of them you had to pay extra (infra red, hamam, solaria), which makes it kind of an expensive day. In other ones I have been to those things were included in the entrance price. It was a public one (bathing suit required). But I have to say that we really had fun. And after the spa we went to dinner at a Chinese place near where we live. And while we were there waiting for our dinner I got my presents. I got 2 products from rituals, a scrub (Good Luck Scrub) and a shower gel in the scent sweet orange and cedar wood. It smells so good! 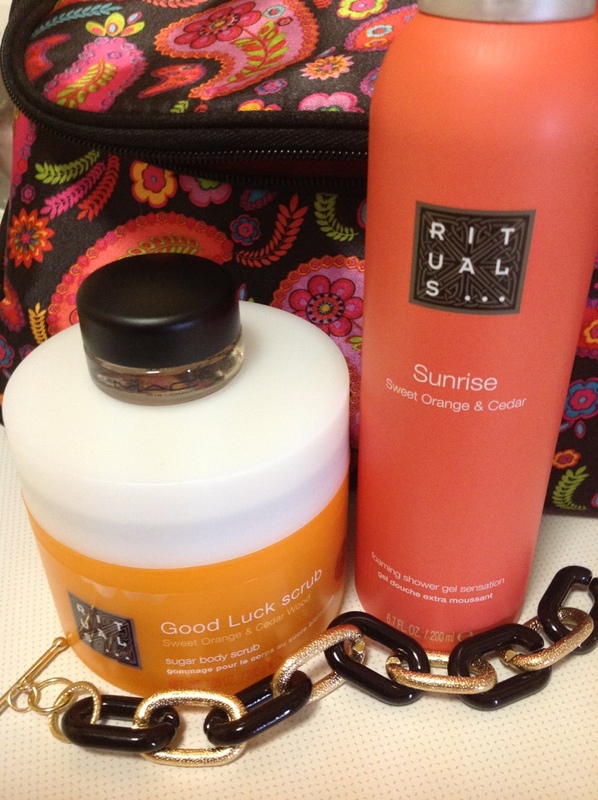 I really like the products of Rituals because they smell good and they are great for my skin. I also got a Mac eyeshadow, it’s the paint pot in the color ‘Bare study’. It’s a very neutral champagne-like color. The eyeshadow is a cream shadow so it is very easy to apply (I use my finger because it is easier to apply that way) and it stays on almost the whole day. And last I got a black and gold bracelet. It’s a nice bracelet that goes with a lot of things. And last but not least my day at the spa was also a present. I also got other presents (mostly money) from family and so, but that was on other days, that’s why I don’t include it here. What do you guys do for birthdays? And what presents do you like to get? This entry was posted in Uncategorized and tagged Birthday, mac, rituals, spa by missnathaliexo. Bookmark the permalink.